Daredevil #10 comes out tomorrow! I know that you’re probably thinking “finally!” and I couldn’t agree more. It’s been a long month with the five weeks that have passed since Daredevil #9 came out. On a more positive note, we’re going to be drowning in Daredevil stuff for the next six or seven weeks so I can’t really complain about that. Still, there’s no reason to wait until tomorrow to start analyzing what may or may not be on the horizon, so let’s get to that below! Note of warning: While I generally post pretty spoiler-free reviews, I’ve come to realize that I’m pretty worthless at protecting people from spoilers lifted from advance looks at covers and solicitations, so if you tend to try and stay away from those, I suggest you stop reading here. Specifically, we’ll be talking about information from the solicitation text for Daredevil #10, #13 and #14, in addition to things Mark Waid has hinted at in reference to Daredevil #13. We all know that this is the road we had to be going down eventually, but I have to admit that I’m really curious about the “how” in this case. What exactly will Foggy find? I even had some fun (jokingly) speculating about this on Twitter today, and others joined in, but as is nearly always the case – particularly with Mark Waid running the show – I’m sure it will be something that never even entered my mind. However, what I’d like to discuss with you guys is the bigger picture here. I’ve already seen a couple of online comments bemoaning what looks (to some, at least) like the new happy vibe going out the window. Without really knowing what we’re heading into, I’m not really all that concerned. Not only do I think anything happening in the next few issues will see Waid & Co. start to lose steam or direction on this book, I applaud the decision to actually have Matt deal with his issues. I think I’ve mentioned this a few times before, but one of the biggest problems I’ve had with the last few years of doom and gloom – as great as they’ve been – hasn’t been the doom and gloom per se, but the fact that the catastrophes in Matt’s life appear to happen one right after another with very little time for Matt to recuperate. Like an overworked muscle, his psyche has kept weakening and too many things have been left unresolved. What I believe Waid is doing is restoring the character to a state where he is believably working through his massive amount of baggage. This in itself is positive and something that may superficially look like just another round of heartache for Daredevil, but is really something altogether different. 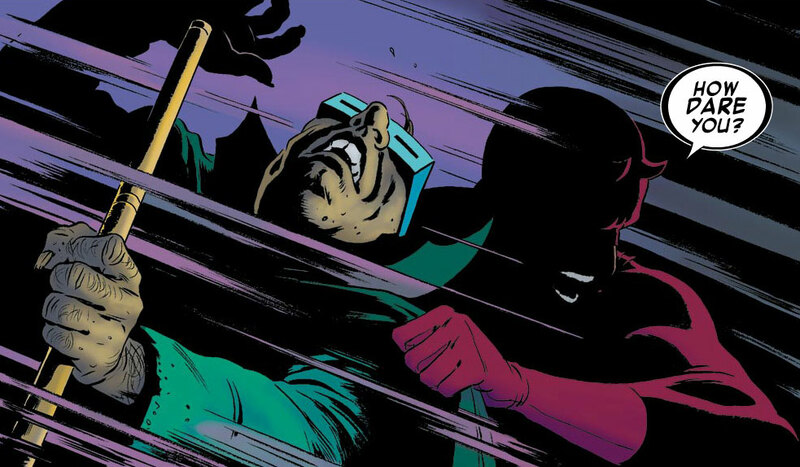 What kind of thing might Foggy discover that would threaten Matt’s future as Daredevil (though it won’t, of course)? Is he finally getting that long overdue cancer in his eyes from the radiation? 😉 My guess is as good as anyone’s, but I personally feel confident that whatever Mark Waid has up his sleeve is more about the evolution and growth of the character than simple shock value. Feel differently about what we might see coming up? Write your thoughts in the comments! Put me in the camp of people who hopes that Matt finally has to deal with his problems, but he then needs to move past them for real. Right now he is just ignoring/denying his issues, which when the faceade cracks could lead to some “dark” times, but I hope Waid will have Matt face his problems so he can actually move on from them and have a genuine positive outlook for a while. At least until the next writer comes along (hopefully several years from now) to do Born Again version 8.0.